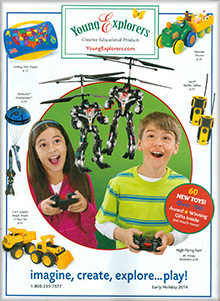 For children's educational toys they won't want to put down, the Young Explorers catalog is at your service. Find an entertaining collection of thoughtful toys that engage, educate and entertain from Award winning science kits to pirate toy ships and outdoor toy fun, all with an emphasis on mind, body and skill development! Young Explorers online toy stores - Whether you're looking for mechanical toys and toy robots for your techie prodigy, space toys for your little astronaut-to-be, musical instruments for the next Beethoven or pirate ships for your little captain, Young Explorers is one of the leading online toy stores featuring a world of high quality educational toys! Outdoor toy - Why stay indoors when you can play outside in the fresh air! Find a toy box filled to the rim with outdoor toy activities they'll adore. Let them go for a ride with pogo sticks and unicycles, fly through the air with bouncing Moon Shoes or dive into the water with plenty of swimming pool toys to choose from! With walkie talkies, rockets and tents, they'll want to play outside all day! Pirate toy ships - Landlubbers rejoice! You don't have to walk the planks for a sea worthy selection of pirate toys for your little matey! Young Explorers online toy stores offer a ship shape pirate collection ready to hit the deck with! From pirate games and pirate chests to toy pirate ships, rafts and other adventurous toys for imaginative play, your kids will be digging for buried treasure in no time. Building toy - For a classic toy that never goes out of style, give your child the gift of building blocks! Nothing gives a child more pleasure or satisfaction than building a toy from the ground up. Find an indoor or outdoor toy construction set from 150 piece block sets to 3D geometric pieces and wooden Mazes and Marbles! For early learning and development, building blocks from Young Explorers' online toy stores are always a sure thing. Kid's learning games - Find challenging games that will get those brain cells working! Find table games the entire family can enjoy with Math, Science, Geography, Memory and even more educational board games to choose from! You'll also find plenty of toys and sets for imaginative game play and dress up at Young Explorers toy store online! Allow your little explorer to discover the world outside and beyond with a new toy globe, sail the Seven Seas with pirate toy ships or cuddle under the covers with an adorable Monster toy that isn't so scary after all. For an Award winning educational toy that will teach them while they're having barrells of fun, you won't want to live without Young Explorers online toy store.